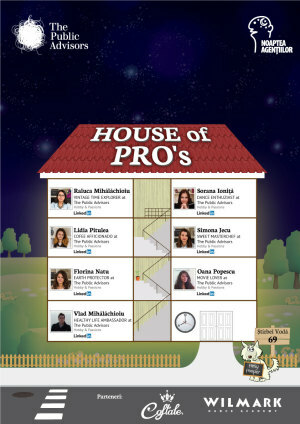 The Public Advisors agency’ headquarters becomes the House of PROs during Bucharest Creative Agencies Night! sweet surprises and a drop of adrenaline! "House of PRO’s – The Public Advisors (Bucharest Creative Agencies Night)" Festival in Bucharest. You can get here description, reviews, address, time and details of "House of PRO’s – The Public Advisors (Bucharest Creative Agencies Night)" Festival in Bucharest. Visit Bucharest Tips for more Festival events in Bucharest!